Peace is one of humanity’s most precious needs. It is also the United Nations’ highest calling. It defines our mission. It drives our discourse. And it draws together all of our worldwide work, from peacekeeping and preventive diplomacy to promoting human rights and development. This work for peace is vital. But it is not easy. Indeed, in countless communities across the world, peace remains an elusive goal. September 21, the International Day of Peace, is an occasion to take stock of our efforts to promote peace and well-being for all people everywhere. It is an opportunity to appreciate what we have already accomplished, and to dedicate ourselves to all that remains to be done. It is also meant to be a day of global ceasefire: a 24-hour respite from the fear and insecurity that plague so many places. 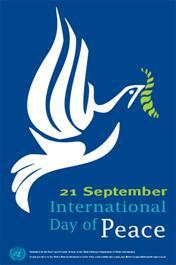 On this International Day, let us promise to make peace not just a priority, but a passion. Let us pledge to do more, wherever we are in whatever way we can, to make every day a day of peace.